Mr and Mrs David Lloyd Kreeger, Washington D.C.
Anon. sale, Sotheby's, London, 10 Dec. 1969, lot 30, where purchased by the present owner. A. Vollard, Album Degas, Paris, 1914 (illustrated pl. 96). P.-A. Lemoisne, Degas et son oeuvre, vol. III, Paris, 1946, no. 1224 (illustrated p. 710). Nottingham, The University, Department of Fine Art, Impressionist Pictures from the Collection of Lord Radcliffe, 1958, no. 6. London, Marlborough Fine Art, A Selection of Important Nineteenth Century French Masters, 1960, no. 11. The present work was executed circa 1895-1900, at a time when Degas increasingly turned to pastel as a medium, attracted by its greater spontaneity and richness in the layering of colour and tone. While oil requires lengthy periods of drying time between the application of layers of pigment, pastel allows the laying of colour upon colour with immediacy. Shackleford described this aspect of Degas' work as follows: 'He also invented for himself a technique of superimposing layers of pastel, through the juxtaposition of partially covered pastel strokes which created an impression of transparency analogous to superimposed glazes in oil painting' (G. T. M. Shackleford, Degas, The Dancers, Washington, D.C., 1984, p.18). The increasing strength of Degas' powers as a draughtsman and colourist during the period in which the present work was executed was much admired by fellow artists. Renoir commented to Ambroise Vollard (who was one of the first owners of the present work): 'if Degas had died at fifty, he would have been remembered as an excellent painter, no more. It is after his fiftieth year that his work broadens out and that he really becomes Degas' (Ian Dunlop, Degas, London, 1979, p. 188). 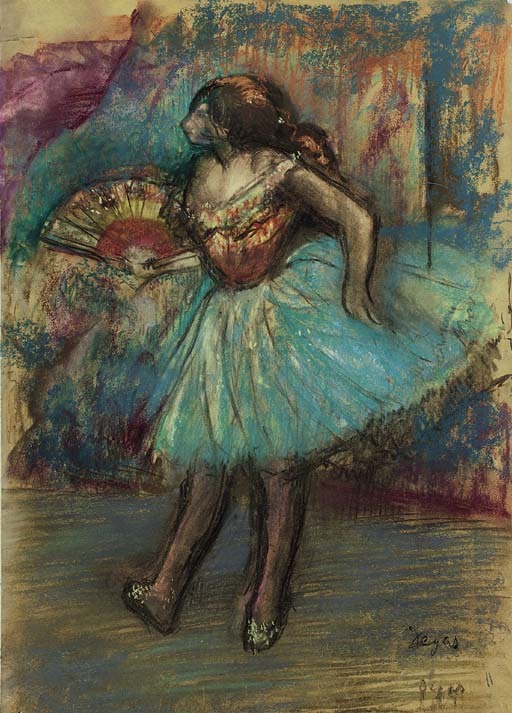 The configuration of the dancer holding a fan appears as part of the composition in other major pastels; Danseuses Roses of 1888 (L. 942), Danseuses of 1897 (Exh. cat., National Gallery, London, 1996, Degas, beyond Impressionism, p. 202, no. 23) and Danseuses dans les coulisses (fig. 1).